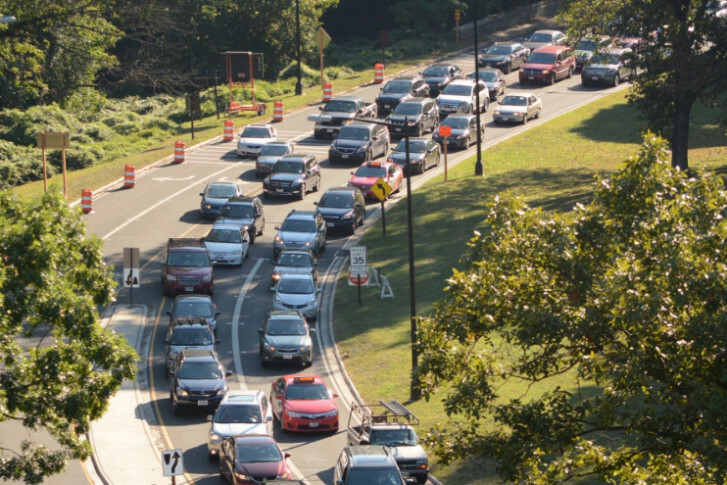 WASHINGTON — Bad traffic, particularly during the morning and evening rush hours, has been a key characteristic of D.C. for many living and working in the area as long as they can remember. When it comes to how well the region can handle unexpected situations, such as inclement weather, major traffic incidents or other events, the District ranks as the worst of 40 major metro areas in the U.S.
One example cited by researchers included a minor snow incident on Jan. 20, 2016 that had historic impact on local traffic. Just 1 inch of snow fell on the region ahead of a major blizzard but it wreaked havoc on evening commuters. Researchers found that even if the various road agencies had far more advance notice to plan for snow plows, as well as their emergency response, the cascade of conditions would still have likely caused a deterioration into gridlock conditions. By comparison, traffic in Los Angeles was found to be inefficient on a daily basis. Yet researchers found that an unexpected event did not dramatically make a particular drive much worse. Researchers found one important reason why unexpected incidents don’t impact commutes as much is that LA has greater availability of and access to backup roads. In a paper published in the journal Science Advances, Maksim Kitsak, an associate research scientist of physics in Northeastern’s Network Science Institute, says the research findings are also important because until now, policy responses and investments to improve transportation networks have been based on normal traffic conditions.